Columbus All American Pet Expo - That Guy with the Birds! 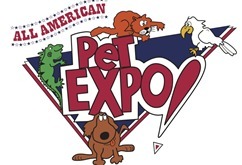 April 25-27 John was at the Columbus All American Pet Expo! This Expo is always a fantastic show and has a great attendance! John would like to thank Steve Cantin & Mythanne Reno from All American Pet Expo for inviting him back and to all the great people of Columbus that came out for the show!